The work of Ree Morton was developed in the context of 1970s American art, characterised by its shunning of Abstract Expressionism’s official supremacy. The piece To Each Concrete Man, whose title draws inspiration from the thinking of Spanish philosopher Miguel de Unamuno (1894–1936), employs everyday materials and found objects to compose an installation that calls upon the viewer to enter the work and explore the notion of space and the relationships that materialise between body and object. The reference to Unamuno in To Each Concrete Man reflects Morton’s interest in writing, and her analysis of the relationship between thought and language. In one of her notebooks, she wrote: “Unamuno upheld the creed of ideophobia. You don’t have to venerate ideas or blindly follow them, you have to use them, like a pair of shoes: you have to subject them to and integrate them into life, into basic reality. Not in a general and abstract sense of life, but in the life of each individual, of flesh and blood [each concrete man]". A large number of Morton’s installations implicitly feature a journey that must be embarked upon by the viewer, who becomes the cornerstone of the work. 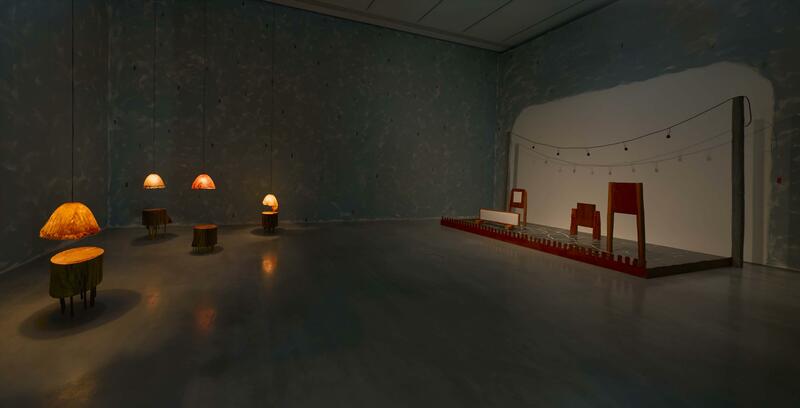 To do so, in To Each Concrete Man the artist turned to several strategies: she separated elements from the wall, created a mysterious light and imagined a scene with stage lighting and inanimate characters in the form of gravestones which come up against natural elements. Thus, Morton devised distinctive imagery whereby theatricality becomes ritualistic as it is drawn towards animism, the belief that attributes a living soul to objects. Morton's body of work can be considered a response to sculptural minimalism, distinguished by the coldness of industrial seriality and predominated by male artists, yet it can also be found closer to outlying, performance- or procedural-based work, related to feminist cross-examinations of art. This view could be framed within that which the theorist Lucy Lippard defined as “eccentric abstraction”, based on the use of ephemeral and at times formless materials that directly allude to sentience and the body. Contemporary Tableaux/Constructions, 1974-1977. / Phyllis Plous. Santa Barbara : University Art Galleries, University of California, 1977. The mating habits of lines : sketchbooks and notebooks of Ree Morton : [exhibition]. Morton, Ree ( 1936-1977)Burlington, Vermont : Robert Hull Fleming Museum, University of Vermont, cop. 2000.